– Senator Saxby Chambliss, ranking Republican on the Intelligence Committee. Well our ever-LYING, traitor-in-chief and his cohort in crime Hillary ‘What Does It Matter’ Clinton are in big trouble…as they should be…as the ghosts of Benghazi have come back to haunt. 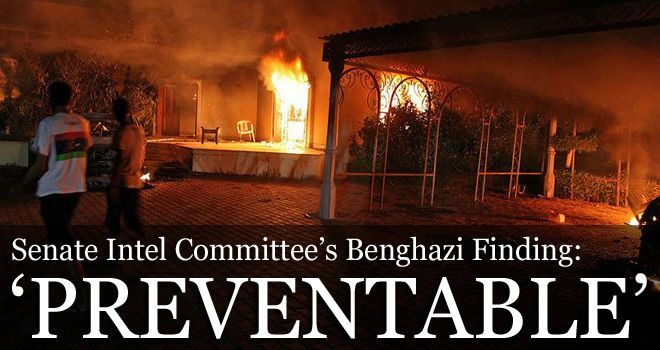 Benghazi can now NO longer be called a ‘phony scandal’ by Barack HUSSEIN Obama or by Hillary Clinton for the bi-partisan Senate Intelligence Committee’s just released ‘supposedly’ comprehensive 85 page report…that is anything but…officially stated what some of us have said since day one…that the attack on our Benghazi compound was indeed a preventable terrorist attack and that any and all policy for handling the attack aftermath was done for political expediency alone. “The bottom line is Hillary Clinton wanted the appearance of normalization” in Libya…Security was not driving these decisions. Politics was,” said Utah Representative Jason Chaffetz, a Republican on the House Oversight Committee. Yet NOTHING about Benghazi was normal as Benghazi became and remains despite this anything but ‘comprehensive report,’ a tale of murder, cover-ups, and LIES all put in place to protect at all costs the ‘anointed one’ and the woman next in line to that title. And yet NO matter how those in Obama’s orbit try to divert the truth, the fact remains that the attack on Benghazi was terrorism…TERRORISM…and that fact must NO longer be glossed over. And this report comes late to the critical fact that Barack HUSSEIN Obama knew damn well that both he and Hillary were LYING through their teeth when they deliberately, calculatingly, and with malice intended, intentionally told ‘We the People’ over and over that the attack that claimed the lives of Ambassador Christopher Stevens, Information Officer Sean Smith, and ex-Navy SEALS Tyrone Woods and Glen Doherty was because the what were ‘peaceful’ demonstrations over the video got out of hand. This report NO matter its true intentions…whether good or bad…tells us NOTHING we already didn’t know even as it lays out that in the first hours after the attack began that every single Pentagon military briefer and defense department official…including General Carter Ham (then head of AFRICOM) and Marine Corps Colonel George Bristol (commander of AFRICOM’s Joint Special Operations Task Force for the Trans Sahara region)…who briefed the White House referred to Benghazi as a terrorist attack and NOT as a response to an anti-American demonstration to a poorly made YouTube video critical of mohamed and islam. Also faulting the intelligence agencies for NOT telling the U.S. military in Libya about the existence of the CIA outpost at the Benghazi compound, the report NEVER touches upon the possibility that maybe the omission was deliberate on the intelligence agencies part because they were covering for the CIA who themselves had something to hide…as in their duplicity in helping Obama run guns and weapons to the al-Qaeda backed Syrian rebels…just saying. Simply, the President of the United States knowingly and willfully LIED to the American people, to the victim’s families, to the media, and to our troops in the field that a farce of a video cost four Americans their lives. And he did this because (I believe) he had to cover-up his own…and possibly Hillary’s…involvement in a constitutionally ILLEGAL and outright criminal guns and weapons smuggling operation to the al-Qaeda backed Syrian rebels that Ambassador Stevens found out about and was going to expose…I have said this since day one and I stand by these words. Obama knew the truth about Benghazi being a carefully planned terrorist attack opportunistically coordinated to mark the 9/11 eleventh year anniversary…he knew it all along and I still wonder if he had a direct hand in it as Stevens had to be silenced at all costs…yet he spewed…as did Hillary…his carefully concocted LIE in the hopes that Benghazi…along with its four ‘bumps in the road’… would just go away especially with the presidential election coming up. And this thought is critical for I believe Barack HUSSEIN Obama hoped that his LIES would help Benghazi go away so that his standing by his video bloviations would appear to his muslim brethren…to whom his true allegiances lie…that he was defending the prophet mohamed against the American infidels. You think I’m kidding…I’m NOT as Obama’s actions or lack thereof NOT only in relation to Benghazi, but in relation to Iraq and Afghanistan as well, speak volumes as to whose side he’s really on. And proof of that is that the report cited the failure of the Obama administration to “bring the attackers to justice,” meaning nobody believed to be involved in the attack or in the cover-up of the attack…as in Hillary Clinton…has gone to jail yet alone been arrested…that is except for the hapless Coptic film maker who made a cheap YouTube video showing mohamed and islam to be the joke we all know they are. “I hope this report will put to rest many of the conspiracy theories and political accusations about what happened in Benghazi,” said Intelligence Chairwoman Senator Dianne Feinstein (D-CA) upon the report’s release, but truth be told all this report does is raise even more questions…questions that must be answered for a sitting U.S. president NOT only LIED to the American people…again…but might also be complicit in the death of four Americans who he watched die in real time before jetting off to yet another fundraiser…and that is NO conspiracy theory or political accusation…that is documented fact. Diane Sori is the Editor of The Patriot Factor. America’s Police State: Worse than Communist North Korea?